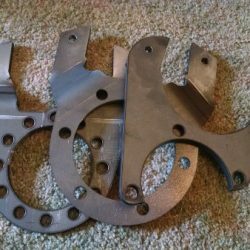 This kit includes two (2) braided stainless steel brake hoses either 12 or 18″ in length. Select your brake hose length below. This product is a pair of D.O.T. approved stainless steel braided brake hoses, with attached fittings for connecting to calipers and hard lines. 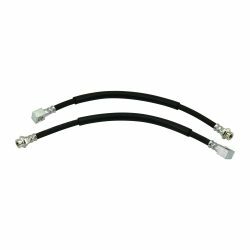 These brake hoses are available in 12″ or 18″ lengths. Generally speaking, we recommend using the shortest possible brake hose, as this reduces the odds of a brake hose becoming tangled on an off-road obstacle, pinched, or wrapped somehow. 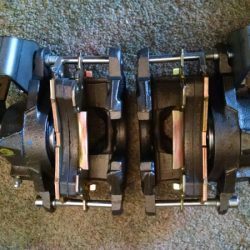 If you’re swapping a solid axle onto a vehicle that previously had an independent suspension, you may find that a 12″ or even an 18″ brake hose isn’t long enough to connect your calipers to the brake line on the frame of the vehicle. Instead of looking for an even longer brake hose than 18″, we strongly recommend that you re-route the front brake hard lines so they are mounted similarly to those on the rear axle. Connecting each brake hose to a hard line on the axle is the best way to ensure brake hoses do not get pinched or caught in the suspension system. 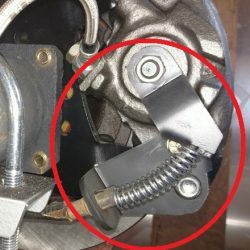 The, connect the hard brake line on the axle to the vehicle at the axle center point (or thereabouts). This way, the hose between the axle and your vehicle’s brake system will be as short as possible, and it will be clear of a lot of the potential pinch points.